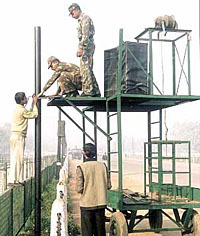 The NCT of Delhi is one of eight States/Union Territories to have set up a Disaster Management Committee and institutionalised the chain of command in order to facilitate certain key agencies to act as first responders in the event of a natural or man-made disaster, including terrorism. After days of bone-chilling cold, the city experienced another sunny day today with a clear sky greeting the people on Sunday morning. However, the warm sunny sky is short-lived, claim the weather experts, who have predicted colder days ahead. The word ‘transfer’ is anathema to the employees, staying with their hearth and home at a particular place for a long time. It is simply not acceptable to the employees of the Municipal Corporation Faridabad, the largest civic body in the state. The recent transfer order of about 38 employees of this body has left the majority of the lower and middle staff hot and bothered. The police have reportedly recorded the statement of a property dealer, Om Prakash, in connection with the alleged duping of the Bharat Sanchar Nigam Limited of Rs 7 lakh and the escape of two suspected ISI agents, Ramphal and Ramesh, from the city. The police today claimed to have lifted several clues to identify the mysterious arsonist, who has set several bogies on fire over the last two months. The police also made a portrait of the arsonist after getting descriptions from some employees. 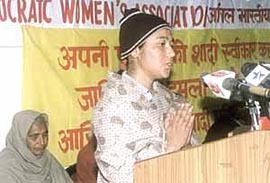 The All India Democratic Women’s Association today raised a demand for effective policy interventions to end the evil of ‘honour killings’. The Haryana unit of the Bharatiya Kisan Union (BKU) has decided to launch a statewide agitation for dislodging the Indian National Lok Dal (INLD) government from power. This was announced by Mr Hari Singh Khokhar, president of the state unit of the BKU, at a district-level conference held here yesterday. After waiting for nearly three decades following its upgradation to sub-tehsil and then to tehsil headquarters, the people of Kharkhauda town can hope for a better living as a number of projects have been sanctioned for developing this area. The Union Minister of State for Sports, Mr Vijay Goel, today stressed the need for providing quality life to the Delhi Police personnel, who often live under tremendous stress and strain. 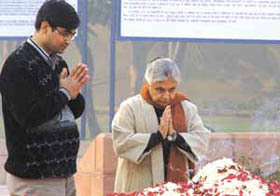 The Union Minister also emphasised the need for a hike in the salary scale of the Delhi Police personnel. New Delhi: The Delhi Chief Minister, Ms Sheila Dikshit along with Union and state ministers today visited the samadhi of the late Prime Minister, Mr Lal Bahadur Shastri, at Vijay Ghat to pay homage on his 38th death anniversary. The District and Sessions Judge, Mr B. L. Singhal, yesterday convicted Sant Kumar, a security guard of a private company, under Section 302 IPC and sentenced him to life imprisonment with a fine of Rs 5,000 or in default to undergo further two years rigorous imprisonment for murdering Tej Pal, a machine operator of the same company on May 24, 2001. Three armed assailants looted gold jewellery worth lakhs of rupees from a jeweller’s house in the Vivekanand Puri area of North Delhi. The police said that the three assailants knocked at the house of Rajender (36), a jeweller in the Vivekanand Puri area last night. Red Tape has unleashed its trendy winter collection of formal and semi-formal shoes for men. Red Tape, high fashion range of semi-formal and casual wear shoes, is constantly designing fashion forecasts to satisfy the tastes of the fashion conscious individual, and is today one of the largest selling brands in its segment. The Christmas and the New Year celebrations over, it is back to the grind. With schools having reopened there is nothing, not even the chilly winter wind that can be excuse enough to stay put in bed. So the children are back to school and the usual rigmarole of homework and tests. 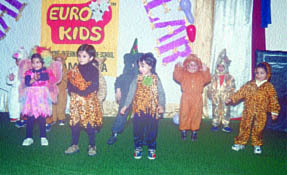 Euro Kids presenting a cultural programme. Whenever a family is blessed with a newborn child, the new guest becomes a bundle of love for his procreators. In no time, the newborn gets priority over the parent’s own personal needs. He is showered with utmost love and affection. God cannot be physically present with all the children to take care of them. That is why He has created ‘mothers’ to take His place on this earth. A mother is like a Goddess for her children, because of the selfless love she showers on them. This love is nothing but a manifestation of God. The Director-General of Police, Haryana, Mr Mahender Singh Malik, will lay the foundation stone of the building of the first girls law college in India at Kanya Gurukul Khanpur Kalan in Gohana sub-division of the district on January 14. The emergency patients in the 100-bed civil hospital, Sonepat, are asked to buy their own medicines, as the hospital cannot afford them. Yes, this is the condition in the government hospitals run by the Health Department of the state government. Even the stock of basic medicines is reportedly running out in these so-called cash-strapped hospitals. 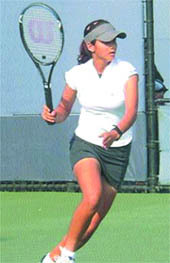 Sania Mirza: Lives up to AITA’s trust. The All-India Tennis Association can derive a lot of satisfaction from the fact that the money and effort it invested on the junior talent in the country is now showing solid results. South Africa handed out an emphatic 250-run defeat on Bangladesh to annex the Commonwealth Under-19 Cricket Championship Trophy at the Nahar Singh Stadium in Faridabad. An all-round performance by Yogesh Nagar (4 for 53 and 88 n o) and an unbeaten knock of 56 by Vikas Garg helped Sonnet Club defeat Gyan Bharati South Delhi Academy by seven wickets in the second Rajiv Gandhi Memorial Under-17 Cricket Tournament. The Haryana Government has directed the municipal councils and municipal committees in the state to ensure payment of salary to their employees before the end of the first week of the month.